Emerging technologies: Are you a leader or a follower? Steve Jobs famously said, "Innovation distinguishes between a leader and a follower." However, many organizations reactively follow emerging technologies instead of proactively leading technology trends. What's the common hang-up? Narrow thinking. Take the iPhone, for instance. When it was first released, employees were anxious to use it in the workplace, but IT departments were reluctant to embrace the trend. Security and logistical concerns prevented IT from enabling technology that could revolutionize workplace productivity. According to IDC's State of Mobility in the Enterprise: Mobile Devices report, only 18.2 percent of enterprises indicated more than 60 percent of their mobile employees had corporate-liable mobile devices in 2011. That was four years after the first iPhone was released. IT was clearly missing the boat instead of steering it forward. Similar challenges persist. In a recent survey, global executives cited costs, security, limited skills and regulatory compliance as the top four obstacles preventing their organizations from applying emerging technologies. The inability to outthink these challenges has real consequences for digital innovation. Executives need to take a new approach to innovation to see digital reinvention initiatives reach their potential. 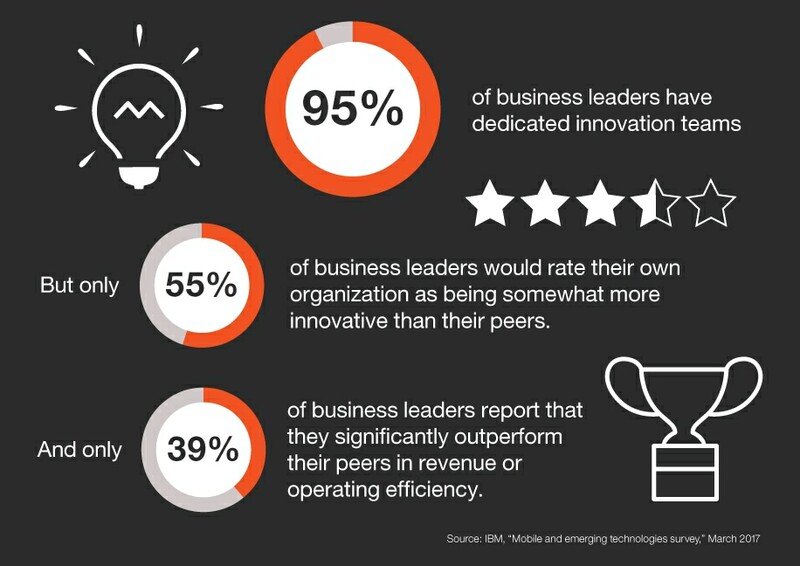 There are several ways to overcome obstacles and use emerging technologies to lead business innovation, rather than follow it. To become disrupters, enterprises need to start fast and scale fast by eliminating obstacles that slow innovation. Numerous companies have done just that. For example, Skype is one of the largest video conferencing companies in the world, despite the fact that it doesn't own any telecommunications infrastructure, and Airbnb is the leading accommodation provider but owns no real estate. Obstacles only exist where workarounds have yet to be invented. New technologies will be the most disruptive industry forces over the next two years, but not all of them make sense for your organization. To evaluate which technologies to adopt, focus on what you want to accomplish, how you can monetize value through new customer experiences and how you can build the talent and ecosystem needed to support the technology implementation. Listen to your customers constantly so you can anticipate their needs. Ongoing research, tight links between IT and marketing and continuous assessments of emerging technologies are vital. Disruption needs room to breathe, so don't stifle your employees' innovation by limiting them to legacy constraints. Above all, maintain a holistic mindset. Convergence is the key to unleashing the power of emerging technologies. For example, the usefulness of drones depends entirely on the integrated intelligent technology layered on them. Telecommunications companies use drones for cell tower inspections, but without the technology to stitch those images together into meaningful intelligence, analysts would be left staring at thousands of images. So, when considering a digital innovation approach, remember that the whole is greater than the sum of its parts. That's where organizations can find their innovation sweet spots.